The macho bellows of the loudspeaker reverberate through the Spokane Veterans Memorial Arena, commanding the blue and orange masses to respond. And they do: With screaming football fans flooding the entire arena, the entire game’s an ebb and flow from rumble to roar. Except for one place. On the upper deck of the west side, it’s silent and empty. There aren’t any seats up there: Just metal panels and a scoreboard. But to host the first rounds of the March Madness basketball tournament, the NCAA requires 12,000 sellable seats. Seats reserved for bands, non-participating athletes and members of the press aren’t included in that total. For now, there’s an easy fix. Spokane Arena General Manager Kevin Twohig says the Public Facilities District plans to fill in about 500 temporary seats throughout the Arena. “Everything we’ve heard so far is that our current arena seating capacity will suffice under the requirements,” Twohig says. • Removing the rigging grid, and placing new mechanical units in the rafters. • Hanging the scoreboard in the center of the arena. • Demolishing the restrooms, concession stands and spotlight landings on the west side, then rebuilding them from the concourse level up. • Adding heating, air conditioning and electrical services. Even after construction is complete, the monthly costs would continue. “Our electrical costs go up, our air conditioning goes up,” Twohig says. The benefit from extra seats, Twohig suspects, would often be negligible. The two permanent Arena tenants will be consulted about any possible seating changes. 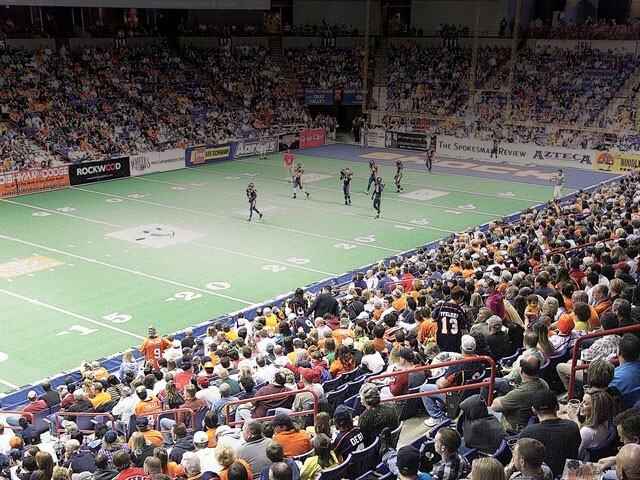 Shock General Manager Adam Nebeker says he’d love more seats. “We have eight home games each year, and every game since we’ve started has sold out or come within a few hundred of selling out,” Nebeker says. New seats may not help the Spokane Chiefs hockey team, however. They play more games on more days. The Chiefs, Twohig explains, need Saturday nights to sell out, forcing fans to buy tickets on less popular nights. More available seats means more fans on Saturday, but fewer on Wednesday. Dave Pier, vice-president of marketing for the Chiefs, says he expects the arena merely to add the number of seats required by the NCAA basketball tournament.